For other uses, see Limestone (disambiguation). About 10% of sedimentary rocks are limestones. The solubility of limestone in water and weak acid solutions leads to karst landscapes, in which water erodes the limestone over thousands to millions of years. Most cave systems are through limestone bedrock. 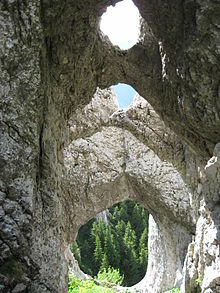 La Zaplaz formations in the Piatra Craiului Mountains, Romania. Like most other sedimentary rocks, most limestone is composed of grains. Most grains in limestone are skeletal fragments of marine organisms such as coral or foraminifera. These organisms secrete shells made of aragonite or calcite, and leave these shells behind when they die. Other carbonate grains composing limestones are ooids, peloids, intraclasts, and extraclasts. Some limestones do not consist of grains, and are formed by the chemical precipitation of calcite or aragonite, i.e. travertine. Secondary calcite may be deposited by supersaturated meteoric waters (groundwater that precipitates the material in caves). This produces speleothems, such as stalagmites and stalactites. Another form taken by calcite is oolitic limestone, which can be recognized by its granular (oolite) appearance. The primary source of the calcite in limestone is most commonly marine organisms. Some of these organisms can construct mounds of rock known as reefs, building upon past generations. Below about 3,000 meters, water pressure and temperature conditions cause the dissolution of calcite to increase nonlinearly, so limestone typically does not form in deeper waters (see lysocline). Limestones may also form in lacustrine and evaporite depositional environments. Calcite can be dissolved or precipitated by groundwater, depending on several factors, including the water temperature, pH, and dissolved ion concentrations. Calcite exhibits an unusual characteristic called retrograde solubility, in which it becomes less soluble in water as the temperature increases. Impurities (such as clay, sand, organic remains, iron oxide, and other materials) will cause limestones to exhibit different colors, especially with weathered surfaces. Limestone may be crystalline, clastic, granular, or massive, depending on the method of formation. Crystals of calcite, quartz, dolomite or barite may line small cavities in the rock. When conditions are right for precipitation, calcite forms mineral coatings that cement the existing rock grains together, or it can fill fractures. Travertine is a banded, compact variety of limestone formed along streams, particularly where there are waterfalls and around hot or cold springs. Calcium carbonate is deposited where evaporation of the water leaves a solution supersaturated with the chemical constituents of calcite. Tufa, a porous or cellular variety of travertine, is found near waterfalls. Coquina is a poorly consolidated limestone composed of pieces of coral or shells. Limestone is a parent material of Mollisol soil group. Two major classification schemes, the Folk and the Dunham, are used for identifying the types of carbonate rocks collectively known as limestone. Robert L. Folk developed a classification system that places primary emphasis on the detailed composition of grains and interstitial material in carbonate rocks. Based on composition, there are three main components: allochems (grains), matrix (mostly micrite), and cement (sparite). The Folk system uses two-part names; the first refers to the grains and the second is the root. It is helpful to have a petrographic microscope when using the Folk scheme, because it is easier to determine the components present in each sample. The Dunham scheme focuses on depositional textures. Each name is based upon the texture of the grains that make up the limestone. Robert J. Dunham published his system for limestone in 1962; it focuses on the depositional fabric of carbonate rocks. Dunham divides the rocks into four main groups based on relative proportions of coarser clastic particles. Dunham names are essentially for rock families. His efforts deal with the question of whether or not the grains were originally in mutual contact, and therefore self-supporting, or whether the rock is characterized by the presence of frame builders and algal mats. Unlike the Folk scheme, Dunham deals with the original porosity of the rock. The Dunham scheme is more useful for hand samples because it is based on texture, not the grains in the sample. About 10% of all sedimentary rocks are limestones. Limestone is partially soluble, especially in acid, and therefore forms many erosional landforms. 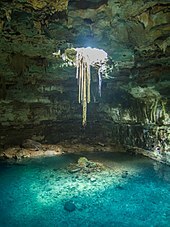 These include limestone pavements, pot holes, cenotes, caves and gorges. Such erosion landscapes are known as karsts. Limestone is less resistant than most igneous rocks, but more resistant than most other sedimentary rocks. It is therefore usually associated with hills and downland, and occurs in regions with other sedimentary rocks, typically clays. Karst topography and caves develop in limestone rocks due to their solubility in dilute acidic groundwater. The solubility of limestone in water and weak acid solutions leads to karst landscapes. Regions overlying limestone bedrock tend to have fewer visible above-ground sources (ponds and streams), as surface water easily drains downward through joints in the limestone. While draining, water and organic acid from the soil slowly (over thousands or millions of years) enlarges these cracks, dissolving the calcium carbonate and carrying it away in solution. Most cave systems are through limestone bedrock. Cooling groundwater or mixing of different groundwaters will also create conditions suitable for cave formation. Coastal limestones are often eroded by organisms which bore into the rock by various means. This process is known as bioerosion. It is most common in the tropics, and it is known throughout the fossil record (see Taylor and Wilson, 2003). Bands of limestone emerge from the Earth's surface in often spectacular rocky outcrops and islands. 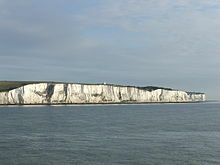 Examples include the Rock of Gibraltar, the Burren in County Clare, Ireland; the Verdon Gorge in France; Malham Cove in North Yorkshire and the Isle of Wight, England; the Great Orme in Wales; on Fårö near the Swedish island of Gotland, the Niagara Escarpment in Canada/United States, Notch Peak in Utah, the Ha Long Bay National Park in Vietnam and the hills around the Lijiang River and Guilin city in China. Unique habitats are found on alvars, extremely level expanses of limestone with thin soil mantles. The largest such expanse in Europe is the Stora Alvaret on the island of Öland, Sweden. Another area with large quantities of limestone is the island of Gotland, Sweden. Huge quarries in northwestern Europe, such as those of Mount Saint Peter (Belgium/Netherlands), extend for more than a hundred kilometers. The world's largest limestone quarry is at Michigan Limestone and Chemical Company in Rogers City, Michigan. The Megalithic Temples of Malta such as Ħaġar Qim are built entirely of limestone. They are among the oldest freestanding structures in existence. Limestone is very common in architecture, especially in Europe and North America. Many landmarks across the world, including the Great Pyramid and its associated complex in Giza, Egypt, were made of limestone. So many buildings in Kingston, Ontario, Canada were, and continue to be, constructed from it that it is nicknamed the 'Limestone City'. On the island of Malta, a variety of limestone called Globigerina limestone was, for a long time, the only building material available, and is still very frequently used on all types of buildings and sculptures. Limestone is readily available and relatively easy to cut into blocks or more elaborate carving. Ancient American sculptors valued limestone because it was easy to work and good for fine detail. Going back to the Late Preclassic period (by 200–100 BCE), the Maya civilization (Ancient Mexico) created refined sculpture using limestone because of these excellent carving properties. The Maya would decorate the ceilings of their sacred buildings (known as lintels) and cover the walls with carved limestone panels. Carved on these sculptures were political and social stories, and this helped communicate messages of the king to his people. Limestone is long-lasting and stands up well to exposure, which explains why many limestone ruins survive. However, it is very heavy, making it impractical for tall buildings, and relatively expensive as a building material. The Great Pyramid of Giza, one of the Seven Wonders of the Ancient World had an outside cover made entirely from limestone. 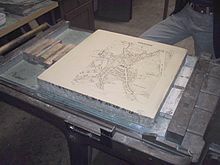 A limestone plate with a negative map of Moosburg in Bavaria is prepared for a lithography print. Limestone was most popular in the late 19th and early 20th centuries. Train stations, banks and other structures from that era are normally made of limestone. It is used as a facade on some skyscrapers, but only in thin plates for covering, rather than solid blocks. In the United States, Indiana, most notably the Bloomington area, has long been a source of high quality quarried limestone, called Indiana limestone. Many famous buildings in London are built from Portland limestone. Limestone and (to a lesser extent) marble are reactive to acid solutions, making acid rain a significant problem to the preservation of artifacts made from this stone. Many limestone statues and building surfaces have suffered severe damage due to acid rain. Likewise limestone gravel has been used to protect lakes vulnerable to acid rain, acting as a pH buffering agent. Acid-based cleaning chemicals can also etch limestone, which should only be cleaned with a neutral or mild alkali-based cleaner. It is the raw material for the manufacture of quicklime (calcium oxide), slaked lime (calcium hydroxide), cement and mortar. Pulverized limestone is used as a soil conditioner to neutralize acidic soils (agricultural lime). Is crushed for use as aggregate—the solid base for many roads as well as in asphalt concrete. As a reagent in flue-gas desulfurization, it reacts with sulfur dioxide for air pollution control. Glass making, in some circumstances, uses limestone. It is added to toothpaste, paper, plastics, paint, tiles, and other materials as both white pigment and a cheap filler. It can suppress methane explosions in underground coal mines. Purified, it is added to bread and cereals as a source of calcium. Calcium levels in livestock feed are supplemented with it, such as for poultry (when ground up). It can be used for remineralizing and increasing the alkalinity of purified water to prevent pipe corrosion and to restore essential nutrient levels. Used in blast furnaces, limestone binds with silica and other impurities to remove them from the iron. It is used in sculptures because of its suitability for carving. People can be exposed to limestone in the workplace by inhalation of and eye contact with the dust. The Occupational Safety and Health Administration (OSHA) has set the legal limit (permissible exposure limit) for limestone exposure in the workplace as 15 mg/m3 total exposure and 5 mg/m3 respiratory exposure over an 8-hour workday. The National Institute for Occupational Safety and Health (NIOSH) has set a recommended exposure limit (REL) of 10 mg/m3 total exposure and 5 mg/m3 respiratory exposure over an 8-hour workday. Removing graffiti from weathered limestone is difficult because it is a porous and permeable material. The surface is fragile so usual abrasion methods run the risk of "severe surface loss". Because it is an acid-sensitive stone some cleaning agents can not be used due to adverse effects. The cyanobacterium Hyella balani can bore through limestone; as can the green alga Eugamantia sacculata and the fungus Ostracolaba implexa. A stratigraphic section of Ordovician limestone exposed in central Tennessee, U.S. The less-resistant and thinner beds are composed of shale. The vertical lines are drill holes for explosives used during road construction. Thin-section view of a Middle Jurassic limestone in southern Utah, U.S. The round grains are ooids; the largest is 1.2 mm (0.05 in) in diameter. This limestone is an oosparite. Photo and etched section of a sample of fossiliferous limestone from the Kope Formation (Upper Ordovician) near Cincinnati, Ohio, U.S.
Biosparite limestone of the Brassfield Formation (Lower Silurian) near Fairborn, Ohio, U.S., showing grains mainly composed of crinoid fragments. A concretionary nodular (septarian) limestone at Jinshitan Coastal National Geopark, Dalian, China. ^ Roeser, Patricia; Franz, Sven O.; Litt, Thomas (1 December 2016). "Aragonite and calcite preservation in sediments from Lake Iznik related to bottom lake oxygenation and water column depth". Sedimentology. 63 (7): 2253–2277. doi:10.1111/sed.12306. ISSN 1365-3091. ^ Trewin, N. H.; Davidson, R. G. (1999). "Lake-level changes, sedimentation and faunas in a Middle Devonian basin-margin fish bed". Journal of the Geological Society. 156 (3): 535–548. doi:10.1144/gsjgs.156.3.0535. ^ "Term 'evaporite'". Oilfield Glossary. Archived from the original on 31 January 2012. Retrieved 25 November 2011. ^ Folk, R. L. (1974). Petrology of Sedimentary Rocks. Austin, Texas: Hemphill Publishing. ^ Dunham, R. J. (1962). "Classification of carbonate rocks according to depositional textures". In Ham, W. E. Classification of Carbonate Rocks. American Association of Petroleum Geologists Memoirs. 1. pp. 108–121. ^ a b Wright, V.P. (1992). "A revised Classification of Limestones". Sedimentary Geology. 76 (3–4): 177–185. doi:10.1016/0037-0738(92)90082-3. ^ "Calcite". mine-engineer.com. Archived from the original on 3 March 2008. Retrieved 13 February 2008. ^ Limestone (mineral). Archived from the original on 31 October 2009. Retrieved 13 February 2008. ^ "Isle of Wight, Minerals" (PDF). Archived from the original (PDF) on 2 November 2006. Retrieved 8 October 2006. ^ "Michigan Markers". Michmarkers.com. Archived from the original on 19 December 2007. Retrieved 25 November 2011. ^ a b Cassar, Joann (2010). "The use of limestone in historic context". In Smith, Bernard J. Limestone in the Built Environment: Present-day Challenges for the Preservation of the Past. Geographical Society of London. pp. 13–23. ISBN 9781862392946. Archived from the original on 15 February 2017. ^ "Welcome to the Limestone City". Archived from the original on 20 February 2008. Retrieved 13 February 2008. ^ Schele, Linda; Miller, Mary Ellen. The Blood of Kings: Dynasty and Ritual in Maya Art. Kimbell Art Museum. p. 41. ^ Kogel, Jessica Elzea (2006). Industrial Minerals & Rocks: Commodities, Markets, and Uses. SME. ISBN 9780873352338. Archived from the original on 16 December 2017. ^ "A Guide to Giving Your Layer Hens Enough Calcium". Poultry One. Archived from the original on 3 April 2009. ^ "Nutrient minerals in drinking-water and the potential health consequences of consumption of demineralized and remineralized and altered mineral content drinking-water: Consensus of the meeting". World Health Organization report. Archived from the original on 24 December 2007. ^ "Limestone". NIOSH Pocket Guide to Chemical Hazards. CDC. Archived from the original on 20 November 2015. Retrieved 19 November 2015. ^ Weaver, Martin E. (October 1995). "Removing Graffiti from Historic Masonry". National Park Service. Retrieved 5 February 2019. ^ Ehrlich, Henry Lutz; Newman, Dianne K. (2009). Geomicrobiology (5th ed.). pp. 181–182. ISBN 9780849379079. Archived from the original on 10 May 2016. Taylor, P. D.; Wilson, M. A. (2003). "Palaeoecology and evolution of marine hard substrate communities" (PDF). Earth-Science Reviews. 62: 1–103. Bibcode:2003ESRv...62....1T. doi:10.1016/S0012-8252(02)00131-9. Folk, R. L. (1974). Petrology of Sedimentary Rocks. Austin, Texas: Hemphill Publishing. Dunham, R. J. (1962). "Classification of carbonate rocks according to depositional textures". In Ham, W. E. Classification of Carbonate Rocks. American Association of Petroleum Geologists Memoirs. 1. p. 108–121. Boynton, Robert S. (1980). Chemistry and Technology of Lime and Limestone. Wiley. ISBN 0471027715. This page was last edited on 9 April 2019, at 12:08 (UTC).